When Haima Manjari Mahanta, a woman from Naikapani village of Pallahara block in Angul district of Odisha joined a Self- Help Group (SHG), she could hardly imagine that one day she would be instrumental in bringing smiles to the faces of many farm families in her village. Haima decided to join Maa Kusumunali SHG in 2011 to meet the medical needs of her family. She became the president of the group within a very short span of time, surpassing many older women in the group because of her dedication and commitment towards various group level processes. She never hesitates to take initiative and because she demonstrated her leadership skills in many instances, she became the voice of many other SHGs in her village. In 2012, she applied for the position of Community Resource Person (CRP) as a part of the Targeted Rural Initiative for Poverty Termination and Infrastructure, A world bank supported project (TRIPTI) and qualifyied and was appointed as CRP in her own village. She was responsible for encouraging and enrolling all the households under SHG structure. During that period she formed, nurtured and strengthened 10 new SHGs. In 2015, TRIPTI project was merged with Odisha Livelihood Mission (OLM) and Haima was re-appointed in the role of a CRP. As a part of her new responsibilities, she started promoting improved agricultural practices among the group members to enhance farm level income from agriculture. This proved challenging for her, since she had no training in conducting training on agriculture for the members due to her own limited exposure and knowledge on agriculture. I still remember those days. It was a difficult to convince the farmers to adopt any new agriculture practice due to my own limited knowledge on the subject, shared Haima. Haimas relief can be seen in the broad smile on her face while narrating her experience of using the Digital Green (DG) approach when OLM started a partnership project with DG in her block during the early part of the year 2016. My task of promoting agricultural practices has become easier since then and convincing people to adopt them is no more difficult, shared Haima. Digital Green trained Haima on the various processes involved while disseminating a video, including how to operate a pico projector and facilitate discussion during dissemination. She was quite excited to see and operate a pico projector for the first time during the training. Haima shared that she has already disseminated 8 videos among 15 SHGs in her own village. Since she was already recognised in the community for her good work and due to her good facilitation skills, many of her group members have adopted at least one practice that they have seen in the videos. She has reported more than 450 adoptions among the members till date. Haima says that she is able to give ample time to other SHG related work since promoting agricultural practices through video based extension system has made her task easier and faster, instead of the practice of going door-to-door or farm-to-farm. She brings two groups together and disseminates a micro practice to 20 to 25 members within an hour. Before every dissemination, she watches the video 2 to 3 times at home to familiarize herself with the content, know the places where she needs to stop and initiate discussion and prepare for all possible questions that the viewers might ask during dissemination. Haima is happy that she is able to add quality to her work as well as improve the rate of adoption, which has become more than twice of what she could achieve lasting the previous year when she was trying to convince the farmers without the videos. Haima shares with conviction that the factors contributing to her success are the visual medium of dissemination, local videos featuring local farmers as actors, the local dialect and the timely dissemination of the videos, i.e. during the actual time of practice. Debaki Mahanta, another woman from the same village and a member of Maa Kusumunali SHG who regularly participates in video dissemination says that these videos have been of great help to all the farmers in the village to understand, remember and adopt the practice. And most importantly the facilitation by Haima during the video dissemination helps them to get new learning and clarify their doubts at the same time. Debaki appreciates Haima’s effort and encouragement to all the members to adopt the practices shown in the video. Debaki has adopted many practices that she has seen in the videos, such as, seed treatment, nursery raising and line transplantation in paddy. All these practices have helped her family to reduce expenses in paddy cultivation. There are many such farm families in the village who have benefitted from the practices shown on the videos and they are grateful to Haima for her earnest effort in motivating them to adopt new practices. Haima is quite happy with her achievement and it is satisfying for her to see that her work has brought such happiness to many such farming families in her village. 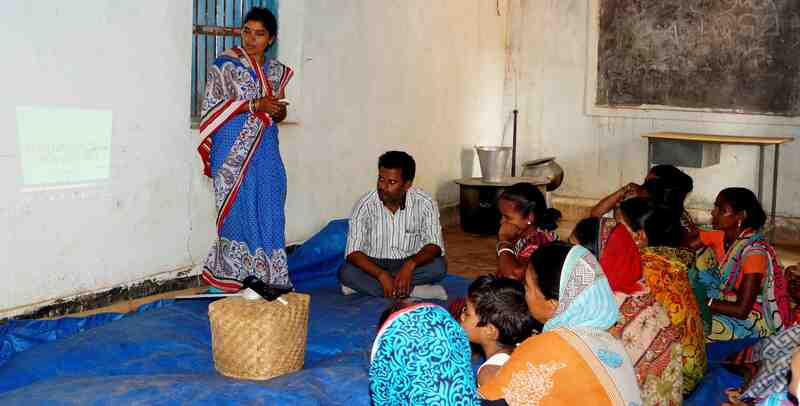 This case study was originally compiled for Odisha Livelihood Mission’s Newsletter. I am impressed by this story and I am having a start up project to assist youth and women in my rural community in South Africa Eastern Cape Province. WE have plenty of land but is not being ploughd and we seem to live on frozen vegetables and I am trying to change the mindset. We started in 2015 and our crop is being destroyed by pests and diseases we do not know. At times by birds so ultimately harvest is poor. If you can support us by any valuable information through video or skype I shall be grateful Please continue to do the good work.